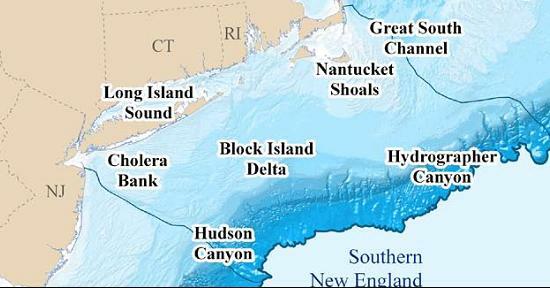 The waters off of Southern New England include inshore, estuarine areas such as Long Island Sound, Narragansett Bay, and Buzzards Bay, as well as oceanic areas like Block Island Sound, Rhode Island Sound, Nantucket Shoals, and the continental shelf that stretchs about 75 miles off the coast. The area is bordered on the west by the coast of New Jersey, on the north by the coasts of Connecticut, Rhode Island, and Massachusetts, and on the east by the underwater plateau of Georges Bank. This are is technically a part of the Mid-Atlantic Bight which stretches south to North Carolina, but because of important climatic differences along the eastern seaboard, Southern New England has its own unique mix of species. Southern New England’s low-lying coastlines and river systems give rise to a string of estuaries along the coast. Rhode Island’s coast is also home to several coastal salt ponds, formed when a spit or barrier beach partially seals off a coastal lagoon from the high-energy environment of the ocean. Semi-protected areas like estauaries and salt ponds support flourishing shellfish industries and provide important nursery habitat for migratory fish species. Salt marshes, eelgrass beds, and mudflats within these systems represent micro-ecosystems of their own, each supporting a variety of species and life stages. Salt marshes provide breeding, refuge, nursery, and forage habitat for a variety of fish, crustacean, and bird species. Subtidal eelgrass beds provide spawning and refuge habitat for fish, oysters, scallops, and invertebrates. Sand and mud flats provide habitat for blue mussels, oysters, hard and softshell clams, annelid worms, and crustaceans, and when submerged, they provide foraging ground for eels and other fish, crabs, and birds. Phytoplankton production in the Sothern New England region is highly seasonal, peaking in late fall and early spring. The early spring peak is not as strong as it once was, perhaps due to climatic changes. Nantucket Shoals is a hotspot for spring phytoplankton, while summertime is a high production time in the bays and sounds. Zooplankton abundance follows phytoplankton, being highest in the spring following the winter-spring phytoplankton bloom. The seafloor provides structure for organisms to adhere to or burrow in, provides food for invertebrates and fishes, and stores nutrients that are occasionally upwelled in a regenerative process. Seafloor communities in the area are dominated by benthic tube dwelling amphipods, species that appear to do well in disturbed areas. Their prevalence may be due to the habitat disruption caused by dragging and dredging, which presumably obliterates many less resilient species.